Ontario Equestrian proudly offers a minimum of five $1,000 bursaries every year to junior members to help them achieve their equestrian goals. 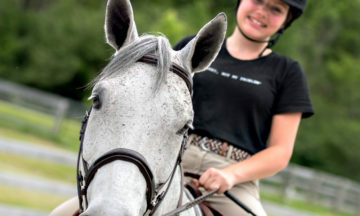 The OE Youth Bursary is aimed at supporting young horse persons of all disciplines who are current OE members, full-time high school students and where financial resources and/or personal hardship is a significant impediment to them reaching their equestrian goals. If you can answer yes to the following questions you are eligible to apply! Are you a current OE Junior Member? Are you currently attending a high school in Ontario? Do you need financial assistance to help achieve your riding goals? The submission deadline for 2019 has now expired. Congratulations to all past OE Youth Bursary recipients!